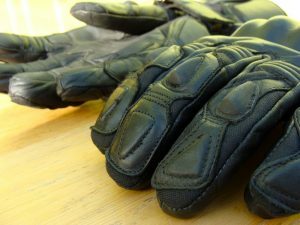 Reviews of motorcycle clothing, accessories, equipment and other gadgets. 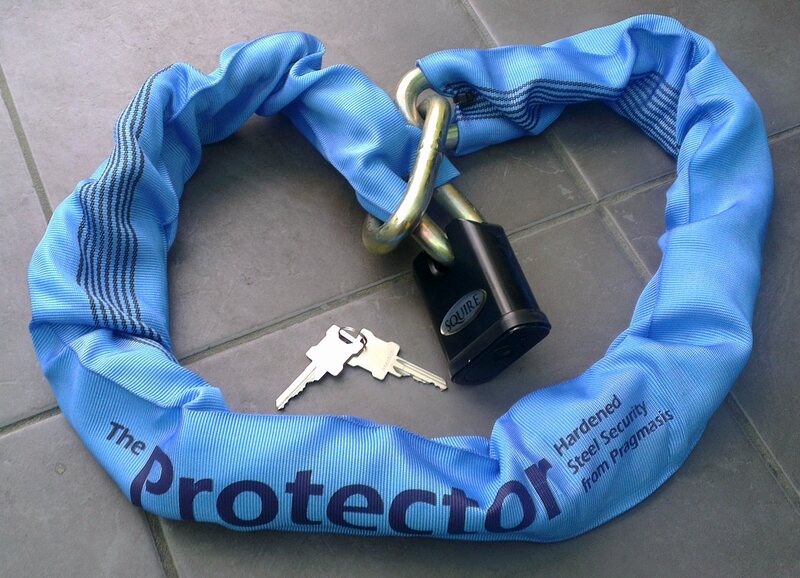 After getting Mary her own motorbike, getting an extra security chain was top priority. 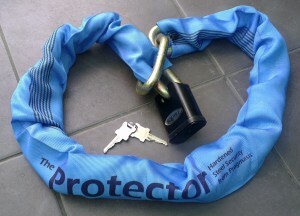 Being so pleased with the Pragmasis Protector chain I’ve been using, they were the obvious choice. I had considered an Almax chain, which are generally regarded as being on par with the Pragmasis chains. Both brands cost the same and are supplied with the same Squire padlock, however Pragmasis offer free next day postage – can’t argue with that. These boots are made for riding. I purchased these boots almost a year ago during the ‘closing down’ sale at Hein Gericke when the UK arm of the company went into administration. As such they were heavily reduced at cost me around £60. Consider this a long term review on how they have fared as I’ve worn them 5 days a week for 12 months during my daily commute. I was initially drawn to these boots as I was looking for something I could wear during the day at work without looking too obvious as motorcycle boots. The discreet black leather design fit this bill well. The Sheltex layer promised to provide waterproof protection and the reinforced sole – impact protection. I took a size 11, but do have narrow feet. The fit of the boots was pretty good, but a little wide, so did necessitate yanking the strap pretty tight. The next size down was too cramped on my toes. 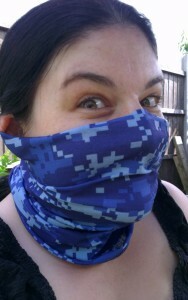 The wonderful people at Hoo-Rag recently sent a couple of their Bandanas in for review. Less well known here in the UK, however the Hoo-Rag is a big product over in the US. Essentially it is a tube of material that can be worn in a multitude of different manners. As a biker I’ve been wearing it predominantly as a neck gaiter, but of course it need not be just for ride outs on the motorcycle. The key thing about the Hoo-Rag, is it’s made from a single seamless piece of soft polyester micro fiber tube. No annoying seams, or labels, just one nice stretchy, soft tube to protect your neck from the wind, cold, dust, insects and so on. Wear it round your neck, over you face, or go all ’80s rocker style and wear it as a headband or bandana. With such versatility and loads of different patterns available, there should be a Hoo-Rag to suit almost everyone. They even do one for your Dog! 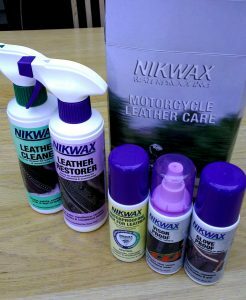 I picked up this kit a few months ago and have been using it every now and again to clean up and condition my leather motorcycle gear. It’s a pretty decent box of bottles covering, head to toe pretty much everything you need. You get leather cleaner, leather restorer, waterproofing wax, glove waterproofing and visor water repellent. Not a bad bundle for £20. The glove waterproofing I used on my Gerbings XR12 gloves, as recommended in their care instructions and on my wifes Buffalo leather gloves. The bottle has a foam top sponge dispenser type thing, which lets you apply and rub the solution all over your gloves easily. Once dry, the solution is completely invisible, but the palms did feel a little slippery on my grips for a day or two. In the wet, it performed exactly as desired, no water leaks, dry hands – job done, big thumbs up. I picked these gloves up second hand after being thoroughly disappointed with my Hein Gericke Pathan gloves. I opted for them based on their wide spread regard on various motorcycle forums and due to their abundance on eBay cheap. As such, I found this pair in almost new condition for £30, a bargain considering they sell new for over £100. The gloves are made from Gore-tex, so totally waterproof. On top of this is, there are sections of leather and a decent amount of knuckle protection. There are two Velcro straps per glove one around the wrist under a flap and one on the cuff. I found the cuff a bit on the short side and didn’t go over my jacket very well, thus letting in a draft and water. My arms are quite long though. These gloves aren’t however the latest iteration, later versions appear to resolve this with an extended storm. 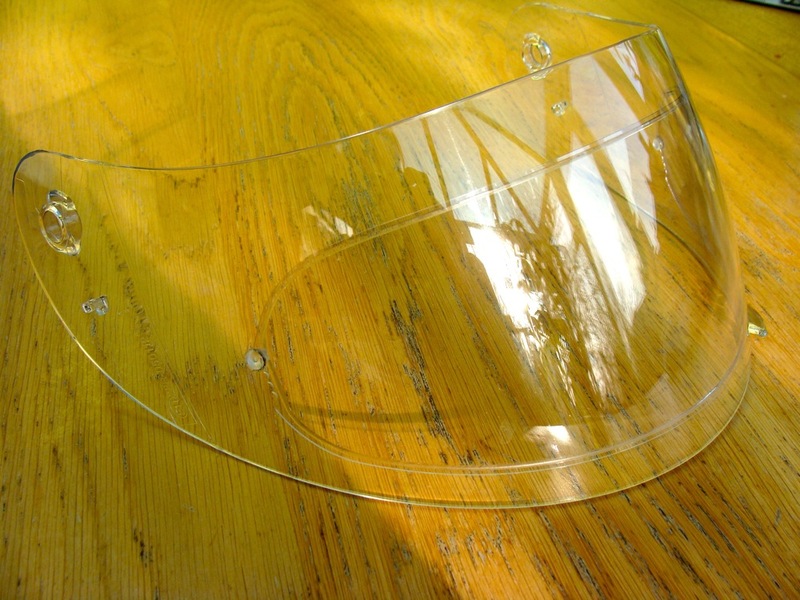 In the cold and wet weather, a steamed up visor is a serious problem. Reduced visibility is just plain dangerous. I find myself having to ride around with my visor open slightly and often totally open when I stop at junctions, to get enough air flow. it’s a constant battle, alternating between cold/wet face and steamed up visor. The problem is twice as bad as a glasses wearer. Once your glasses are wet, even when not steamed up, visibility is poor. I know I recently picked up some decent Alpinestars Goretex gloves, but I saw these gloves on special offer through BuyaPowa. They operate in a Groupon kind of way, where the more buyers who sign up for the deal, the cheaper the deal gets. 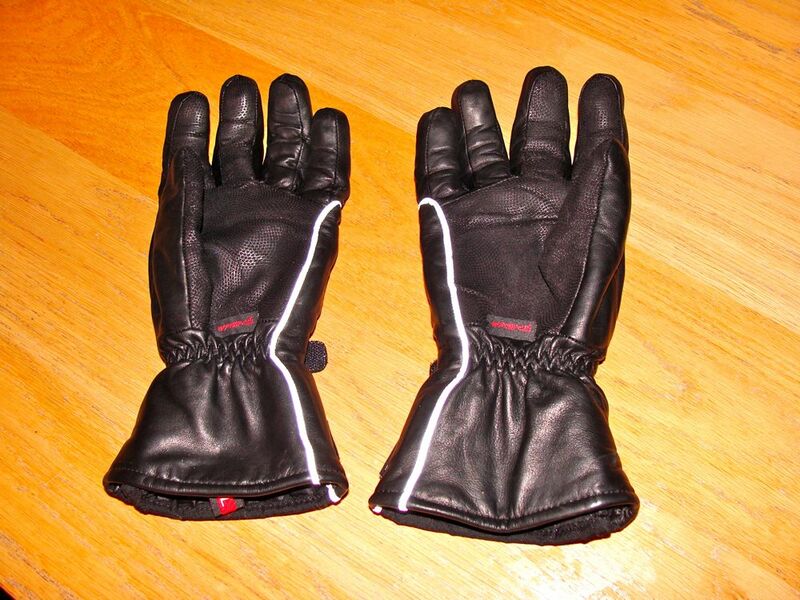 Either way, I managed to get these Gerbing’s Heated Gloves for the super price of £100, that’s a good £60 off. They took a while to turn up, after the deal closed, but are definitely worth the wait. These were the first pair of gloves I bought, having picked them up in the lengthy summer sale at Hein Gericke, whilst I was still learning. As you know, Hein Gericke UK went into administration in July, but have since been rescued by the German arm of the company and so many of their shops still remain. 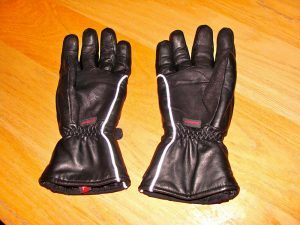 In choosing these gloves, I was looking for a good all round glove, and had thought an all year round glove would be viable. Oh how wrong I was. Unfortunately I don’t have the luxury of a garage or shed to store my motorbike, I have to park the bike on our driveway, open to the elements. There’s no two ways about it, a bike will never last as well stored on the drive like this. But a decent rain cover can mitigate this somewhat. But which cover? It seems you spend anything from a tenner to nigh on a monkey for a top notch cover. But what is really worth it? I was looking for something durable, water proof (duh! ), not going to melt on the exhaust and easy to put on and take off. 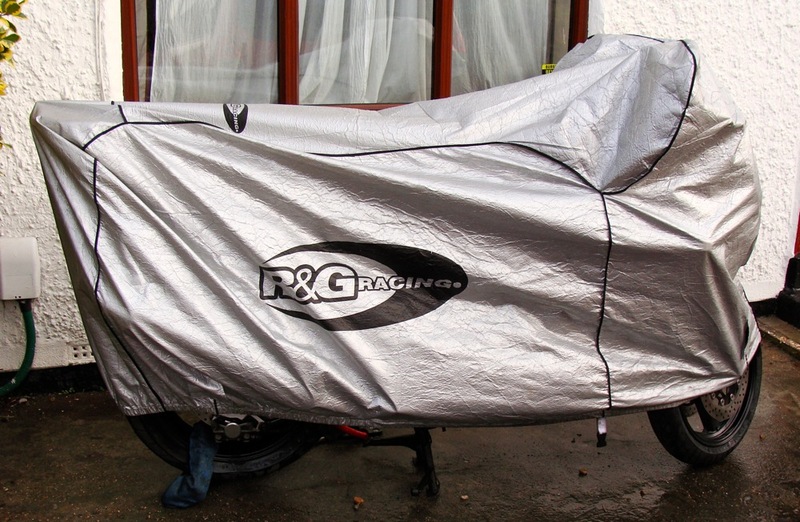 Going through the reviews, the general verdict was an Oxford Stormtex or R&G Racing Superbike cover, which come in at £40 and £60 respectively. The Oxford cover has the edge in the heat proof stakes, but costs more. 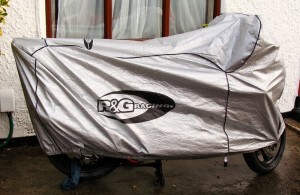 However R&G have an outlet store on ebay, where I managed to pick this cover for a measly £25! No contest. Edit: The cover is a little tight fitting, particularly so since adding the Givi top box rack, which juts out a bit at the back. As to heat from exhaust, I’ve never had a problem, by the time I’ve chained up the bike and removed top box, the can is plenty cool to pop cover over the top. Visit the R&G Outlet Shop on Ebay. 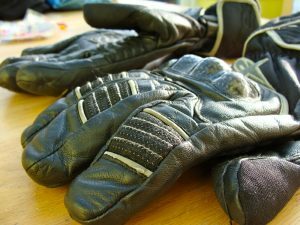 When it comes to protective clothing on the bike, leather is still one of the best choices. Maybe not as waterproof as Goretex, or hard wearing as Kevlar, but on balance, it tends to be best overall value for the money. The other advantage, is there is loads of leather gear available second hand, often it very good nick. 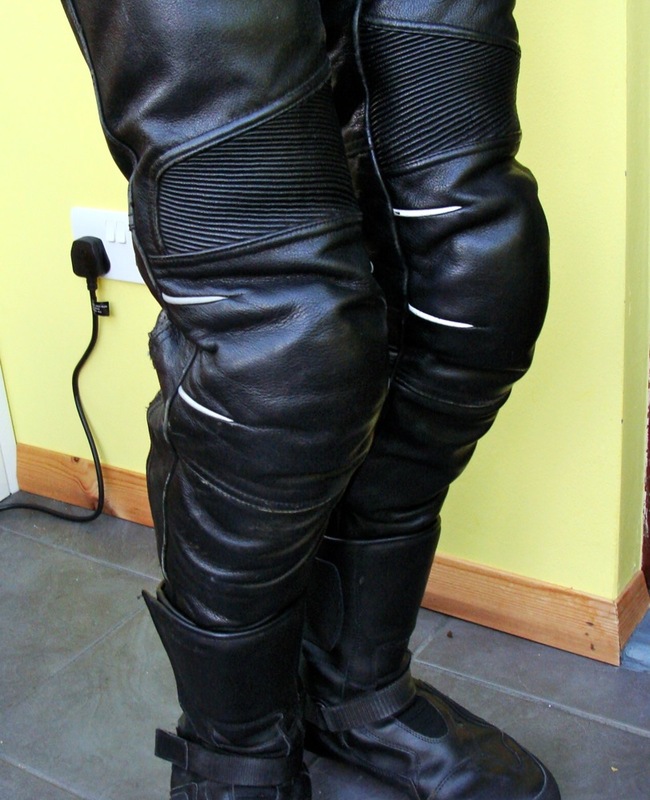 A fine example of which was these Alpinestars Bat Leather trousers. I picked these up from a chap off the London Bikers forum, for the princely sum of £50. I already had some Hein Gericke leather trousers, I had picked up new in their recent closing down sale. However they were a loose cut style and a tiny bit big in the waist. Pulling the tabs in on the waist causes the leather to ruck up and becomes uncomfortable after a while. Moral of the story: buy what fits, not what’s a good price. Anyway, back to the Alpinestars Bat Pants; they are quite low down in their range, but still normally retail for about £200. 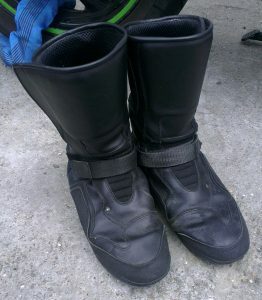 Protection wise, they just feature some layered leather knee pads – no knee-down sliding in these. They are a slim fit, with stretch panels and zips in the calf sections. They’re snug to get on and need a bit of wiggling to pull them up, but once in, they fitted me very well and were very comfortable, even after long periods of time. Only a couple of down sides: Firstly, the single pocket on the right thigh, fine for a phone, but too tight for a wallet. So, once I take my jacket off, I’m stuck for pockets to keep my keys and wallet safe. Secondly the knee protection has a habit of folding over when putting your feet in, so needs flattening before zipping up the calves. This can be a bit awkward and annoying, however it may be down to the age of the leather and having lost some of its original rigidity. Overall, I very happy with the trousers, much prefer the tight cut style. They’re very comfortable and I’ve not worn my old Hein Gericke trousers since.